Philadelphia have lost it! Everyone knows you can’t make a Thai green curry with cream cheese. Plus, it looks disgusting. But can they convince us otherwise? Don't be frightened! It's NOT Cthulhu. 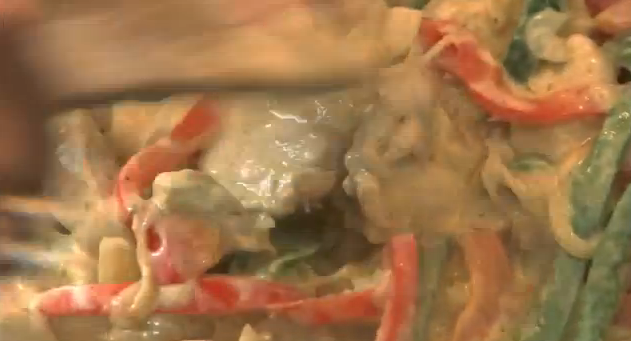 It's simply a Thai green curry. Apparently. In the 90s, Philadelphia’s ads featured Sara Crowe and Ann Bryson in a series of hilarious cheese-related escapades. The campaign ran for the best part of ten years, before viewers were shocked to see the ditsy, dairy-loving pair ripped apart by wild dogs in a blood-soaked finale being phased out. It was the snack (and lighter meal option!) of choice for everyone struggling to escape the crushing horror of office life with broad humour and a dollop of cheesy goo. But in 2012 Philadelphia is more, much more than that. It’s the magical meal ingredient that can bind any dish – and any family! – together. “My biggest challenge is trying to find something easy that everyone enjoys eating,” says Mum, and we hear from the kids that one of them doesn’t like vegetables and one of them doesn’t like curry. Mum’s deliciously cruel solution to this conundrum is to serve a CURRY full of VEGETABLES. You have to applaud her ingenuity. Of course, we’re led to believe that Philadelphia will make this concoction creamy and appetising, but if you’ve made it past the terrifying picture at the top of this post you’ve seen the truth of that for yourself. So what makes this family so perverse? The artfully messy room is supposed to make them seem normal and approachable but look at that pile of board games. I grew up in a board game family myself and there’s a particular frame of mind that goes with it: you learn to be sociable and competitive, but hanging over it all is a crushing awareness of the cruelty of fate. The dice roll and we find that in games, as in life, most of us end up losers. 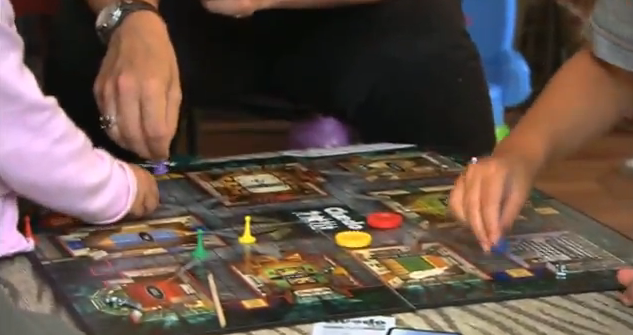 And they’re playing Cluedo. Cluedo! The most evil, laborious, badly-structured and mind-numbing game of all time. And they’re all moving their pieces at the same time! It’s like they want to punish themselves. I have to conclude that this family has got everything it deserves. Including their disgusting curry. If Philadelphia was once the condiment of choice for comedy secretaries, it’s now the magic ingredient for the white family who’re happy to have a jar of green Thai paste in the house but who’d find buying and opening a tin of coconut milk just that little bit too ethnic. This entry was posted in Adverts explained and tagged adverts, cheese, cluedo, curry, fate, games, philadelphia. Bookmark the permalink.